Years of experience in competition and hunting rifle accuracy went into the creation of this Reloading Manual. Highly successful competition and extreme distance hunting. It combines the Life's Work of Walt Berger and the knowledge of the best rifle ballisticians, engineers, benchrest competitors, and precision reloaders... 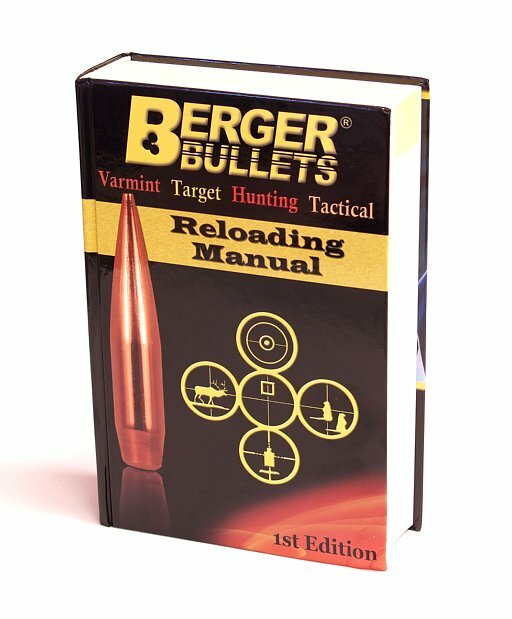 The First Edition, first ever written and printed... Berger Bullets Reloading Manual. A quick look at the table of contents reveals the expertise and innovation Berger is famous for: A discussion of the variation from lot to lot of gun powder; Powder burn rates; G1 vs. G7 ballistic coefficients; An introduction to benchrest/competitive rifle shooting; Effects of Cartridge Overall Length (COAL) and Cartridge Base to Ogive (CBTO)... Of course there's a massive amount of reloading data on the most popular rifle cartridges (pretty much ALL of the 6.5mm for example... Sorry, no 6.5 BRM data though). There's basic, beginner reloading instruction as well as advanced techniques of reloading. Its a wealth of knowledge, like a college degree in reloading (unofficially, anyway)... Your's for a bargain of a price... Order Your copy today! And if you need some Berger Bullets, Please Click Here.